We are pleased to launch our new “Who We Are” initiative! Our first profile focuses on Dr. Henry Siu. This initiative will help us to learn more about people from across the department and the great work they are doing in our communities. These profiles will be published periodically. To suggest a DFM colleague, please click here. Problems that come with age are the focus of Dr. Henry Siu, 39, whose special connection with seniors began when he was raised by his grandmother. 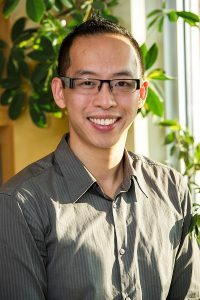 Dr. Siu is a full-time academic physician with one of the Hamilton area teaching sites of McMaster University’s Department of Family Medicine, the Stonechurch Family Health Centre on Upper Ottawa Street. He’s a mentor to residents of family medicine at the clinic, a researcher advancing elder care with funding from the Canadian Frailty Network, and director of the University’s program for Enhanced Skills, Care of the Elderly. But to his patients here at the Stonechurch clinic, he’s Henry. Henry’s parents arrived in north Toronto from Hong Kong in 1984, and worked full-time to make ends meet. So it was his paternal grandmother, Suk Chun, who from age 72 walked Henry and his younger brother and sister to school, befriended the neighbours, baked, cooked and “basically ran the place,” he says. Suk Chun lived a full life into her 90s, always based in the family home. Henry’s early career was in research, exploring the world of molecular biology and basic science. While pursuing his postgraduate degree, he increasingly missed having contact with people. He enrolled in medicine at the University of Toronto, and completed his residency in Family Medicine at McMaster University. Through all of this, he found that he loved the work of the family physician, and the prospect of a long-term connection with patients. Ever the researcher, he still spearheads studies that help seniors and support their independence. One of his priorities is preventing unnecessary medications and their complications. He lives in Oakville with his wife Diana, 37, a pharmacist he met at the University of Toronto, and their two sons, Connor, 4, and Spencer, born November 19.